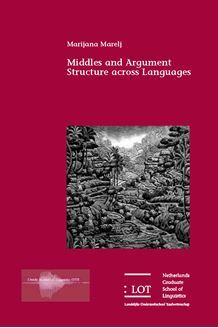 Middles across languages share a core of common semantic characteristics. Yet they exhibit striking differences, as shown on the language-sample that includes Dutch, English, Hebrew, French, Italian, Polish, and Serbo-Croat. The author argues that a single ARB operation, inspired by the ARB-saturation of Chierchia for impersonals, can derive the shared semantic properties of middles across languages. The operation is parameterized to apply in the lexicon or in the syntax, along the lines proposed by Reinhart and Siloni for reflexivization. This explains the linguistic variation. The theoretical framework assumed in the study is Reinhart’s Theta System. The analysis rests on further development of the thematic feature-system (theta roles). A new feature cluster (ARB) - unspecified for any feature – is introduced. Logically, this cluster is needed for the feature system to be well defined, but it had no empirical witness before. The author argues that when Middle Formation applies in the lexicon, it involves a feature-change, creating the ARB role. When it applies in the syntax (LF), role-manipulation is not available, and it involves the arbitrarization of a variable instead. The syntactic differences follow from the locus of the operation. The lexicon operation is restricted to operate on the verb’s grid, the syntax operation can access ECM subjects. A further consequence is that in lexicon languages the middle subject is base generated, but in syntax languages it merges internally and moves. Several other modifications of the Theta System are proposed such as a restriction on the realization of the clusters (FITR), which restricts the expressive power of the system and facilitates the solution to puzzles of theta realization other than middles.